True survival horror is coming back in a big way! Developers and publishers finally seem to feel comfortable with taking risks in the genre again, and we are seeing some great titles lined up in the future. A true AAA survival horror game hasn’t been seen for a while, honestly. Resident Evil became more action oriented, and the quality in Silent Hill games really dropped. Of course, in recent years we saw a resurgence in the genre thanks mostly to indie developers. Outlast, Amnesia: The Dark Descent, and Slender: The Arrival all made very strong cases for the viability of the genre, and certainly helped to renew the interest. Some could even argue DayZ helped show gamers are okay with dying and dying often. The games industry at large seems to have taken notice, and this year at Gamescom we are seeing two strong looking survival-horror games. The first has been known about for a while: Alien: Isolation. Yes, I’m sure many of you are skeptical about the game, especially after Aliens: Colonial Marines was such a huge flop. Still, early gameplay footage and previews make the game look promising and genuinely terrifying. I was able to get my hands on the game in E3 2014, and you can expect the all the hallmarks of any good survival-horror games: a limited toolkit, a feeling of powerlessness, and a high difficulty curve. The biggest surprise from Gamescom 2014, however, was Silent Hills. Sony teased the game with a short demo known simply as P.T., which lead into the teaser for the game and some big reveals. Hideo Kojima will have his hands in the game as will Guillermo Del Toro. Norman Reedus will apparently be adding his acting talents to the game. Judging by the teaser demo, Silent Hills will bring the game back up to the top of the list of horror titles once again. Hideo Kojima’s flare for cinematics plus Guillermo Del Toro’s imagination for creatures and animations should easily make this a game to remember. One game that’s also worth mentioning is Fatal Frame Wii U. If it’s anything like the first, it should be amazing. Sadly, it’s not coming overseas to the United States. Or, at least there are no plans for it to come to the United States. Perhaps if we raised enough of a fuss, it could possibly make it over. It’s not unprecedented. 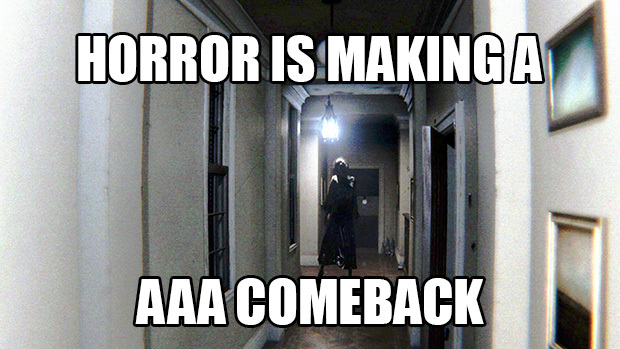 Will we be seeing more AAA survival horror games in the future? The success of these two games just might determine the future of the genre, but here’s hoping.